June 22, 2012. Kestrel arives in Wilmette!! Great photo!! My name is Allison Canade and I live in Wilmette, Illinois. 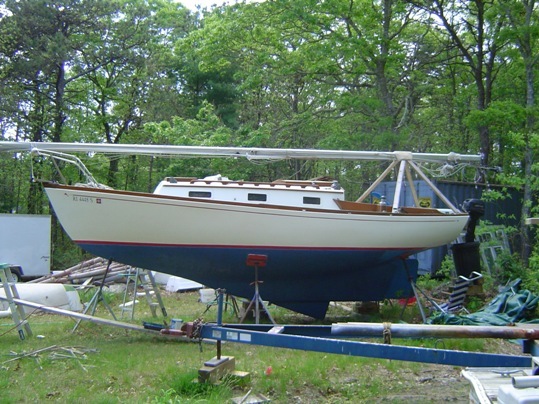 My husband (Terry) and I just purchased Kestrel (Yankee #110) from Dianne Davis in Cape Cod (Pocasset). 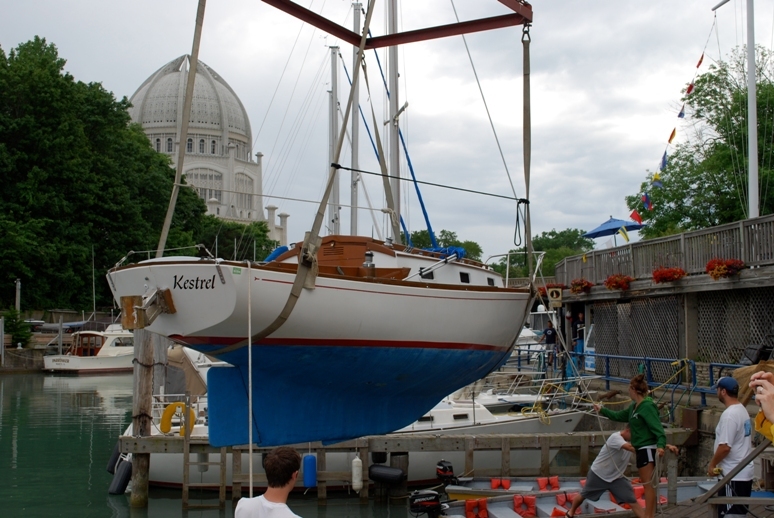 Tomorrow morning Kestrel is scheduled to be picked up in Pocasset and shipped here to join the fleet of Dolphins in Wilmette Harbor. Looking forward to her arrival. 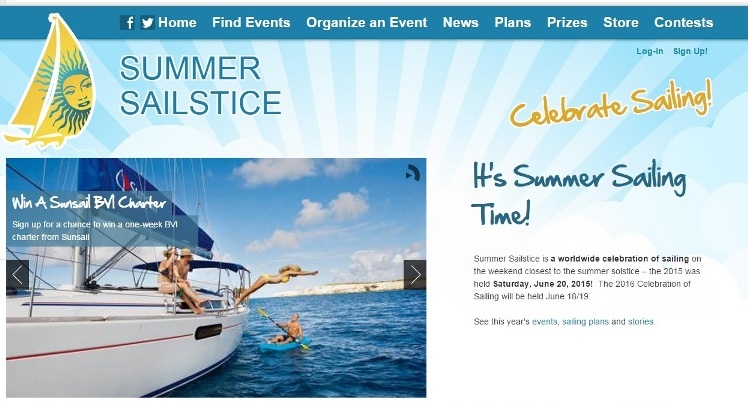 I enjoy the Dolphin24 website and am grateful for it as that is how I found Kestrel! Thanks for such a prompt updating of the webpage! Kestrel is a July 4th birthday present from my husband. There will be much celebrating when she arrives safely in her new harbor! I hope someday my path will cross with Dianne Davis. She could not have been more helpful and kind. 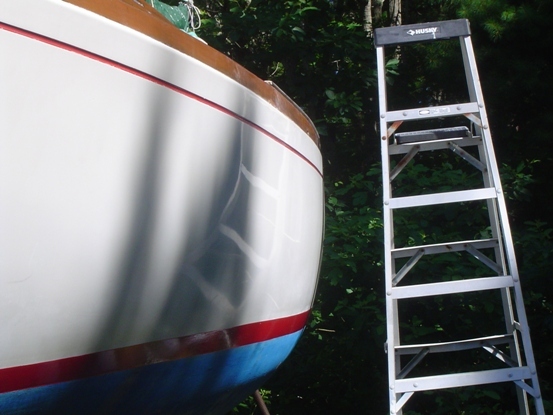 It is bittersweet because I have fallen in love with this boat before setting foot on her and realize for Dianne it is sad for her to let go. I know someday I will be in the same situation and hope I can be as helpful and kind to the next owner as Dianne has been to me. We plan to keep the name Kestrel (a red white and blue north american falcon). It seems to fit perfectly and honors her history. 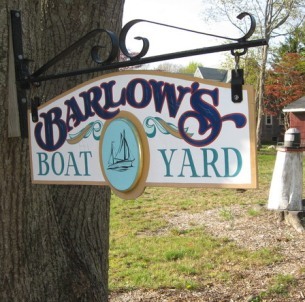 Deal went through and Kestrel has left my back yard to go to Barlow's Boat Yard. She will wait there for the buyer's truck to arrive tomorrow AM to take her to Wilimette, Illinois. Sad day for me but a day that had to be. I'm sure the new owner, Allison Canade, will check in soon. She had been wonderful to work with throughout the whole long distance sale. 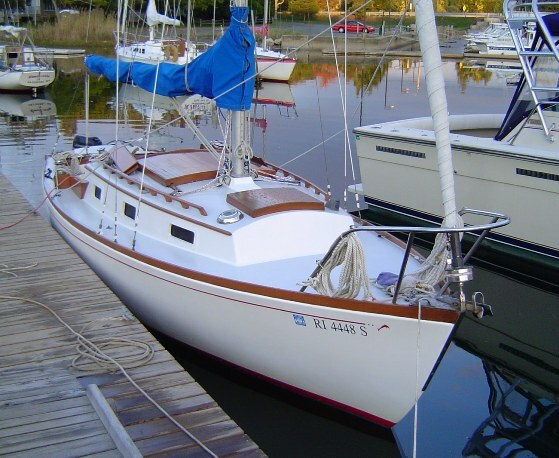 We registered and sent in our plans to race (on Marionette) that day in Off Soundings, but failed to send photos…..
At this point we start the history of Kestrel with prior owner Dianne Davis. Dianne originally checked into the website with the following (edited) emails and pictures, including the picture above. This particular one always impresses with how good looking Dolphins are! 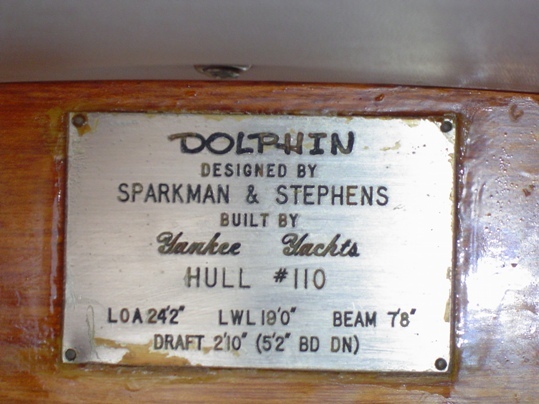 My wonderful Dolphin, Kestrel #110, 1969 is located in Pocasset, Ma. (Upper Buzzard's Bay). I have pic's that I can email in a few days. 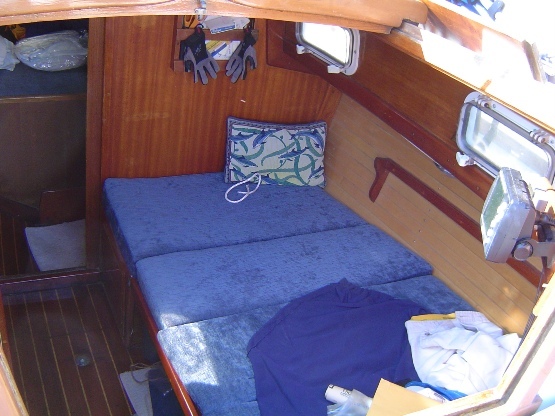 The boat is pristine, inside and out. Thanks for this website! 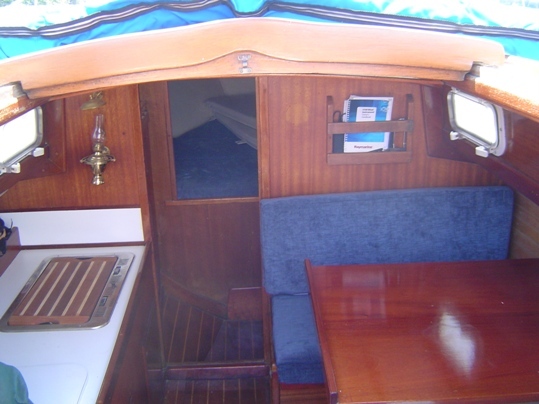 I've attached a few pic's of my boat. I've owned Kestrel for about 7 yrs. 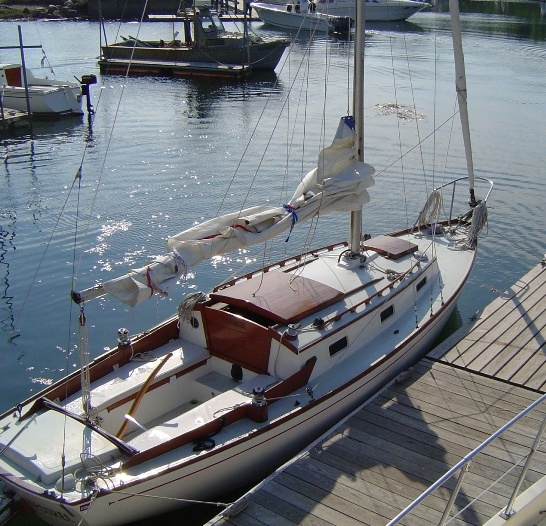 Bought her from a broker who said the man who owned her lived in NYC but kept the boat on Martha's Vineyard. Kestrel was the name at that time. 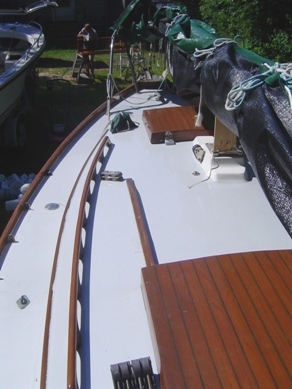 Hadn't been in the water for a few years and was in need of some TLC but had new full-battened North main and dacron/myler radial furling genny (great! 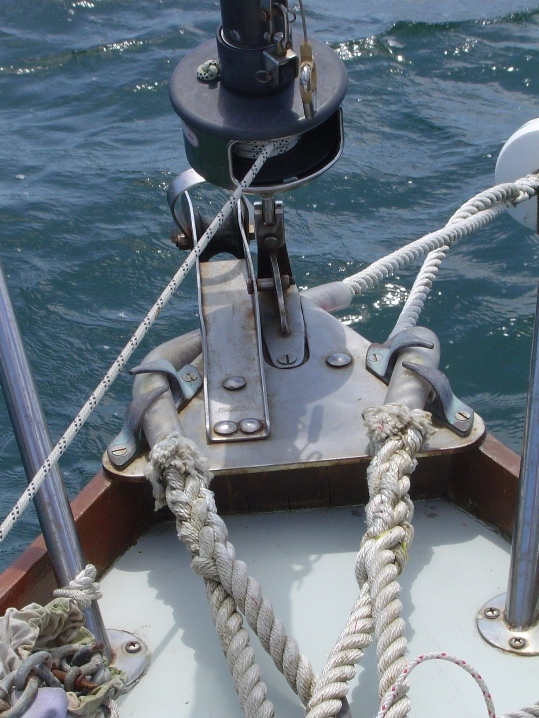 keeps it's shape even rolled up to almost a hankerchief), new harkin roller furler,all new standing rigging (not mast), custom galley and all new opening ports. The Evinrude 8 hp. engine had been pulled out of the well and mounted on a transom bracket for better manueverability. but.... ug. 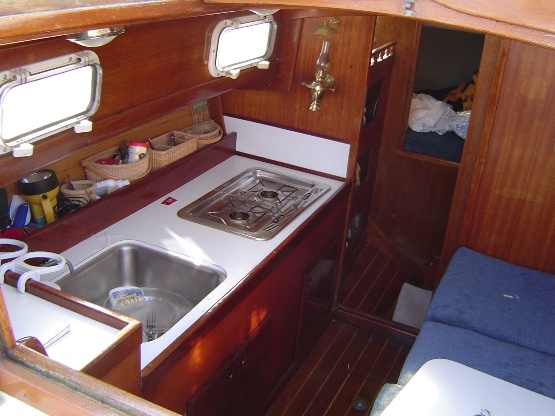 I stripped all exterior and interior wood and revarnished/cetaled, added depthsounder, wind speed/direction, autotiller, new cushions -interior and cockpit, installed holding tank, stripped bottom and put on ablative paint, awlgripped the cabin sides and cockpit, added solar vent and bimini. Probably did a few more things but can't recall now. 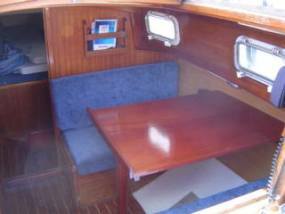 This is the 'convertible dinette"
November 8, 2008. Dianne clearly has something going with her Dolphin, I wonder if she remembers how it all started? We found the following email in the archives of Jim Huxford's old website files. Great job with the website! Keep up the great work. I'm thinking of buying a new genny. The one I have is a combination Myler/Dacron and, althought in perfect shape, it's almost impossible to keep/get the mildew out from between the layers. I send it to North Sails and they do the best they can to bleach it but it's now sooooo ug, especially after this damp year! 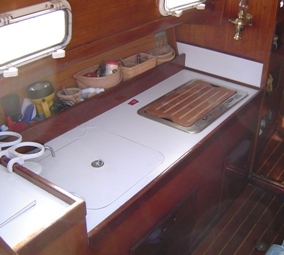 I'm going ahead and purchasing a new genoa since mine was so mildewed - remember that Dacron/Mylar combination. 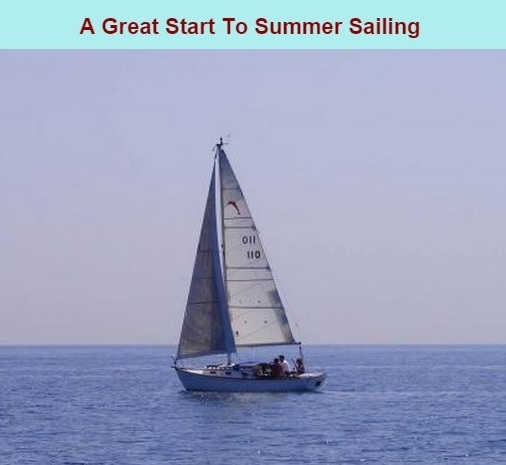 I went to Noth Sails in RI (they are actually Cruising Direct as well). 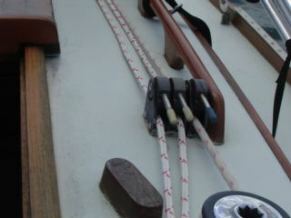 Since it's pretty windy on Buzzards Bay in the afternoon's, and I usually have to furl up my 140%, I went with a 120%. Also went with the Dacron instead of the Mylar. Hope the Dacron furls up / keeps the shape as well as my old sail...but hoping I won't have to furl it as much!! Not bad price - $678 total. September 14, 2011. Dianne sent in a few more pictures of Kestrel. This time Kestrel really is (going to be) For Sale, but there is a wrinkle. Dianne is taking off for a long cruise in the Carribbean on their 'big boat with headroom' and won't be around to show her before next Spring. Communications might be problematic. Seriously interested, and patient, buyers can contact the webmaster at RonBreault@Dolphin24.org and we'll try and patch you through. See below for a list of equipment and offering price. April 30, 2012. She's baaack!! Dianne checked in and will be in touch soon with the list of interested parties. May 26, 2012. Dianne advised that Kestrel is Sale Pending! We'll stand by for Sale Completed, and for the new owners to check in.